About a month ago, I was singing the praises of some ravishing redheads I ran into on Long Island. Those fine specimens showed rich auburn, the color one usually means when describing heads of red. Well, I just met a redhead flashing a shade of crimson found only in a bottle or, better yet, on a bird. 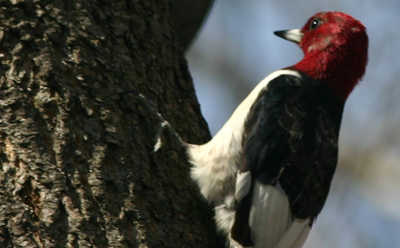 A Red-headed Woodpecker has bravely weathered winter in the reckless wilderness of New York’s Upper West Side. With every week that passed, reports described how the young male’s plumage was coming in, attaining a deeper and more complete scarlet aspect. While I’ve been too busy chasing other rarities around, I finally reached the point where disinterest in this particular piciform was inexplicable. After all, I’d never seen a Red-headed Woodpecker before. While Melanerpes erythrocephalus may be found throughout most of the eastern United States, it is fairly uncommon, if not downright rare, in the New York area. The closest I’ve ever gotten to spotting one of these birds has been the New Jersey license plate (false advertising, if you ask me!) Yet here was one hanging around less than 10 miles from my home. A Friday lunchtime excursion was planned to rectify this glaring omission. I arrived at 92nd St and Riverside Drive in no time at all and began a surprisingly short vigil. After no more than a minute, a very kind woman came over to ask me if I’d seen it yet. She explained that I was fortuitously standing right in front of the woodpecker’s preferred perch, adding that she’d seen the bird yesterday. There we chatted about the likelihood of this twitch turning out well when, speak of the devil, a diabolically handsome woodpecker with a devil-red head flew to the tree right before us. The Riverside Drive Red-headed Woodpecker had arrived! They’re great looking birds, aren’t they! Not fair, picking on NJ, as we do have them, although they’re very local. Rather than running up to the Great Swamp where they’re pretty reliable, I waited for one to show up closer to home at Allaiire State Park a few Springs ago. They’re also pretty reliable down in South Jersey at Batsto. Once you learn the type of habitat they like – fairly open, oak woods, it’s easy to imagine that they should be everywhere. Glad you took the time to find one closer to home. Maybe he’ll stay! I think I have seen them at the Great Swamp in NJ, at the heronry overlook. That was back in 2005. My best sightings have been around here, though I find that they do not like the District all that much. Maybe city life is not all that appealing to them. Interesting that this bird was excavating a hole. I wonder if it plans on staying. To my knowledge, red-headed woodpeckers are sexually monomorphic, so it could be either a male or a female, unless you have reason to think otherwise. Laura, I apologize if I offend. For once, my swipe at Jersey was unwarranted! 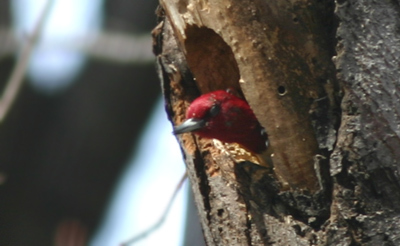 I’m still sore because I took an unsuccessful run at the Ridgewood Red-headed Woodpecker in February. It’s good to know that they are reliable at the Great Swamp, though I’ve never had much luck there. John, I believe excavation is a male behavior. No offense – just doing my duty. They aren’t as reliable at the Great Swamp as they used to be. They used to be there just about every year. We’ve gone dry two years in a row now. The heronry overlook, or what might now be an officially abandoned heronry, is the best spot. I think the NJ plate is false advertising. RHWP’s breed in NJ in minute numbers, but they should have made something else the face of conservation. Maybe a Piping Plover? I guess the PP doesn’t have the pizazz of a RHWP. I’ve lived in NY (upstate) my entire life and have never been able to cross these off my life list despite being native to the region.